Can we use Open Badges with the Computing Progression Pathways? Can we use Open Badges in a similar way to old style levels using the Computing Progression Pathways? Can we use Open Badges and Progression Pathways in an assessment system that is focused on life after levels? Can you split a project into two Digital Badges? Is there a standard set of Open Badges for the Computing Progression Pathways? How can I get involved with using the Computing Progression Pathways Open Badges? Which platforms can I use badges with learners? Mozilla Open Badges use free software and an open technical standard. Any organisation can create, issue and verify digital badges. Any user can earn, manage, and display these badges all across the web. Open Badges help knit skills together. Badges can build upon each other, joining together to tell the full story of a learner’s skills and achievement. With Open Badges, every badge is full of information. Each one has data built in that links back to the issuer, the criteria it was issued under, and evidence verifying the credential — features unique to Open Badges. Open Badges enables learners to take their badges everywhere with them. Users now have an easy and comprehensive way to collect their badges in a single backpack, and display their skills and achievements on social networking profiles, job sites, their websites and more. Individuals can earn badges from multiple sources, both online and offline. Then manage and share them using the Open Badges backpack. Yes! Open Badges provide the perfect opportunity to accredit learners’ learning via non-standard means. Open Badges help to provide a richer picture of the learner and as they contain all of the evidence and criteria within them, they mean that learners can look back on their previous learning to help them progress. Using the Computing Progression Pathways, a series of Open Badges have been created, mapped to both the colours (rows) and also each topic (column). Although the badges can be used to support a structured teaching sequence, they have been produced with the idea of providing independent learning opportunities for learners that extend the teaching and learning that goes on in the classroom. Yes. The Computing Progression Pathways are structured so that competencies within each colour (row) increases in difficulty. As the learners progress through the topic colours the Open Badge design remains the same, however the colour changes to reflect the achievement. The downside to this approach is that, quite often, learners will be working at different ‘levels’ within a class, and so treating the Computing Progression Pathways as a linear approach could mean that learners recognise they are working at a different level to others within their class. Furthermore, learners may also be working towards competencies from different colours at any moment in time, making the allocation of an Open Badge for a particular colour and topic difficult. Treating the Computing Progression Pathways as a more fluid approach means that learners can be working at different coloured topic stages without the impact on their self-esteem if they are working at a “lower” colour than their peers. Yes. One approach might be to combine learning statements from different topics (columns) and colours (rows) of the Computing Progression Pathways to create a custom Digital Badge based on project work (learning journey). Alternatively, awarding Bronze, Silver and Gold coloured versions of the Digital Badge based on attainment of the learning statements. An example of a structured (linear) Open Badge project are the Code Kingdoms BBC Micro:bit recipes. These tutorials guide the user through the elements of writing programs for the Micro:bit using the Code Kingdoms editor through six project badges - each mapped to the Programming and Algorithms topics within the Computing Progression Pathways. As the Computing curriculum focuses on a variety of topics and strands, there will be a multitude of opportunities to work on more than one badge at a given time. As the learners are encouraged to explore the Open Badges through Independent learning it might be a good idea to assign badges at the beginning of a topic which you know your learners are likely to be working on. For example, your learners may also be working on skills addressed within the Information Technology or Communication and Network topics - therefore having access to all of these badges, at the colour they are currently working on, will help support their learning journey. Makewav.es and DigitalMe are two organisations that have come together to support a set of Open Badges to compliment the Computing Progression Pathways. The badges were created by a teacher using Makewav.es and are now collated in a central area to make it easy for all teachers use. These have been produced as part of a wider Computing Curriculum support portal for practitioners. 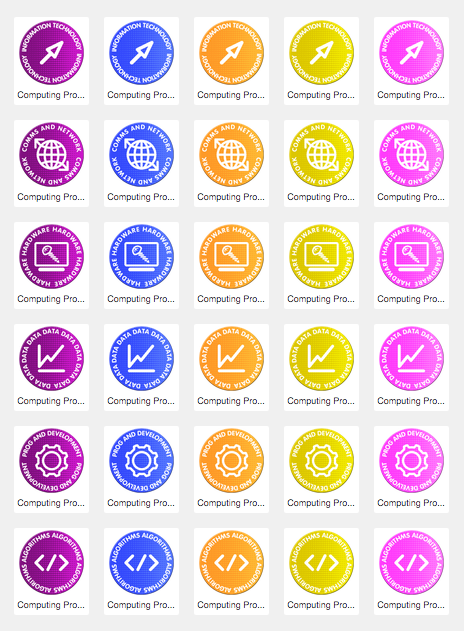 The badges based on the Computing Progression Pathways allow learners to explore the Computing curriculum through independent learning opportunities and submit evidence to meet criteria from the statements. Additional curriculum and CPD badges from Computing At School, Naace and a variety of other education organisations can be found here. To use the badges with your learners you will need to sign up for a free Makewav.es site for your school. You will then be contacted to receive free telephone training to help get your school set up and running with the Computing Progression Pathways badges. Your learners can earn an Open Badge and then share this out to other platforms. Makewav.es is a safe social badging platform where you can create your own Open Badges, or use the existing Computing Curriculum Open Badge sets. Moodle virtual learning environments also have Open Badge creation tools, although there is no central public badge library for sharing badges across schools. You can create school digital badges in Edmodo; however, these are not Open Badges.